We construct portfolios using quantitative value criteria. There are many ways to measure the ‘value’ you are buying for a given price. A quantitative value investor calculates ratios of ‘value’ to the current cost to invest in the company. Academic studies show that various measures of company earnings, cash flow and book value, when used to rank stocks, resulted in high return portfolios. An example using the highest earnings to price (the inverse of the well known P/E ratio) as a value metric is shown below. The graph shows two value investing portfolios compared to the Standard & Poors 500 stock index with dividends reinvested and Treasury Bonds.The graph displays the cumulative return investing $1 at the beginning of a 53 year period through 2014. This is the same data as shown on the “What We Do” page. The graph below uses a linear instead of a log scale and shows the end value of the portfolios after investing only $1 on December 31, 1961. One value stock portfolio is capitalization weighted. In the other, value stocks were equally weighted. Both easily out-performed the stock market index. We prefer to invest in companies rather than funds. The reason? Higher returns and lower risk. We use an excellent value metric, similar to the earnings/price ratio, as a starting point before conducting a company analysis. Potential future growth may be included in the analysis but historical value metrics take priority. Our methods are quantitative and objective. We weight the portfolio optimally to increase returns. An index fund and most diversified mutual funds and ETFs are capitalization weighted. That means that big companies with the highest stock prices are the largest investments in the funds. Putting more money into the other companies besides the biggest has historically provided a better return. For example, in the graph above, an equally weighted portfolio of value company stocks performs best, as shown in the tallest column on the right. In general, funds typically have too much money and this prevents them from investing in a more equally weighted portfolio. This is true even for funds using alternatives to capitalization weighting. We can weight SoundBridge client portfolios in a more optimal way than a fund to achieve higher returns. We can tailor and adjust portfolios as a Client’s needs change. Use tax loss harvesting to reduce taxes. The Sharpe ratio, a measure of portfolio return compared to risk, indicates that the equal weighted value portfolio has less risk per unit of return than both the S&P 500 total return index and the capitalization weighted value portfolio. They may differ significantly over short periods but the data suggest that a more equally weighted portfolio has a clear advantage for the individual investor. 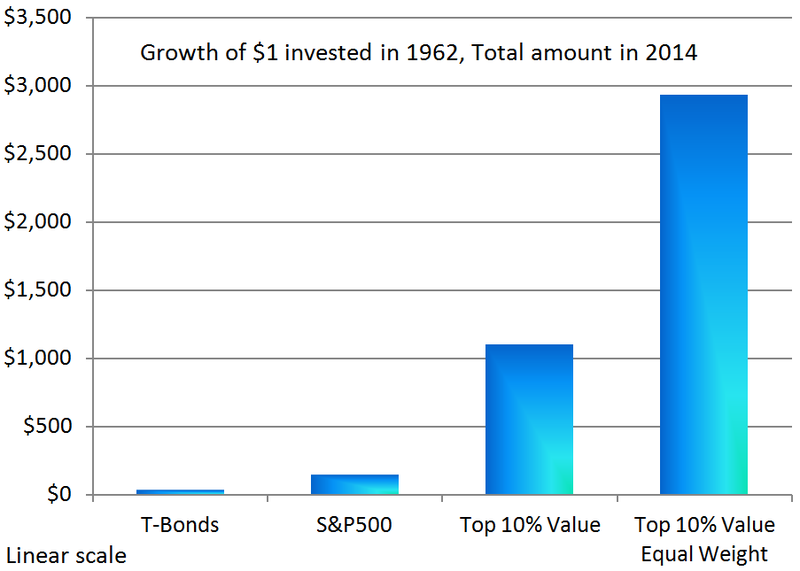 The investment back-test period was 12/31/1961 to 12/31/2014. Taxes and management fees are not included. Note that an estimate of transaction costs is included only for the value portfolios to provide a conservative comparison. The Bond return was derived from the Federal Reserve database for 10 year treasury bonds. No transaction costs are included. The S&P 500 return is the Standard & Poor’s 500 stock index for U.S. stocks which was first published in 1957. Stock market databases, from which the value portfolios are constructed, are more reliable after 1961. So the comparison begins after 1961. This is a total return series including reinvested dividends. No transaction costs are included. The Top 10% Value return is derived from the stock data at The Center for Research in Security Prices (CRSP) at the University of Chicago as published by Professor Ken French, Dartmouth College. The portfolios were constructed at the end of June each year based upon the earnings/price ratio (E/P). Calculations used the earnings before extraordinary items for the last fiscal year for each company and the price multiplied by the number of shares outstanding at the end of December. The E/P ratio is a proxy for value. The universe of U.S. stocks was divided into ten portfolios based upon the E/P ratio. Only the top E/P portfolio out of the ten portfolios (“Top 10%”) is shown in the graph. The stocks were held for one year and the portfolio reconstructed each June. Dividends are included. The amount of each stock in each portfolio is weighted by the capitalization of the company. That is, larger companies are weighted more heavily in each portfolio. Large investors and funds are typically limited to constructing portfolios that give more weight to larger companies due to the large amount of money they must invest. A one percent transaction cost was deducted each year. The Top 10% Value Equal Weight return uses the same data and method as described for item #3 above except that the stocks in the portfolios are equally weighted instead of capitalization weighted. Middle size and smaller size companies make a larger contribution to the portfolio return. Individual investors have a better opportunity to invest in a more equally weighted portfolio. A two percent transaction cost was deducted each year. Data in the graph are the result of back-testing and are not the result of actual client investments. Back-tested data are presented with the benefit of hind-sight. The purpose of the graph is to illustrate general value investment principles. We estimated transaction fees for the value portfolios based upon the size of the stocks involved. Past performance is no guarantee of future results. Investors cannot invest in an index directly. Investments in markets can be volatile. Prudent investors use fixed income and other strategies to reduce risk. SoundBridge works with you to customize your portfolio to your requirements.